KANSAS CITY, Mo., Jan. 29, 2018 /PRNewswire/ -- To celebrate the debut of the Certified Pre-Loved iPhone 7 and iPhone 7 Plus — exclusively available at VirginMobileUSA.com in February — Virgin Mobile® USA announced today that if you post why you love the mobile carrier on Twitter or Instagram and use the hashtags #VMULoveLetters #Sweepstakes before Valentine’s Day, you could win a phone plus one year of service on the Inner Circle plan. "At Virgin Mobile, we strive to make mobile simpler and redefine what’s possible in a complex industry," said Doug Smith, chief operating officer and general manager of Virgin Mobile USA. "We’re excited to make our Certified Pre-Loved program even more compelling by adding iPhone 7 and iPhone 7 Plus, giving our customers more choice at a great value. And you can rest assured that your iPhone is backed by a one-year Apple limited warranty." A Certified Pre-Loved phone is tested and inspected according to Apple specifications. Additionally, it is restored to factory default settings including a new battery, and loaded with the latest version of iOS. Best of all, the Certified Pre-Loved iPhone comes with a one-year Apple limited warranty as well as Apple EarPods and a charger — both of which are brand new. Virgin Mobile currently offers the Certified Pre-Loved iPhone 6s and iPhone 6s Plus at prices ranging from $279.99 to $379.99. The carrier will offer the Certified Pre-Loved iPhone 7 and iPhone 7 Plus in February at prices ranging from $379.99 to $429.99. "Offering both the Certified Pre-Loved iPhone and new models at VirginMobileUSA.com means customers can purchase the iPhone that works for them, whether it’s a Certified Pre-Loved iPhone 7 or a brand new iPhone X," said Smith. With great customer experience and outstanding service, people love the Virgin Mobile Inner Circle plan because of the unprecedented introductory offer of $1 per month for the first six months. This offer is just one way Virgin Mobile defies traditional industry rules, as customers also enjoy no annual contracts, no activation fees and no overages. After the initial offer of six months of service for only $1 per month, Virgin Mobile Inner Circle members will transition to one of the mobile industry’s best values: $50 per month for unlimited everything (talk, text and high-speed data). Virgin Mobile’s service is powered by Sprint’s nationwide 4G LTE network, offering overall network reliability that beats T-Mobile and performs within one percent of Verizon and AT&T.1 In addition, Sprint’s national average download speed is up 60 percent year-over-year according to Ookla Speedtest Intelligence data.2 In 2018 Sprint is dramatically increasing its network investment to further improve coverage, reliability and speed for its millions of customers across the country. 1 Average network reliability (voice and data) based on Sprint’s analysis of Nielsen drive test data in the top 106 metro markets; latest drives completed from August to December 2017. 2 Average download speed increase based on Ookla’s analysis of Speedtest Intelligence data comparing December 2016 to December 2017 for all mobile results. Prices: All prices exclude taxes. AutoPay enrollment required for Inner Circle plan. $1 Per Month for Six Months Offer: Number transfer required. After promotional period $50 regular rate applies. Virgin Mobile reserves the right to change or cancel offer at any time. Unlimited Voice and Data Services are On-Network Only: Unlimited 4G LTE data where available. Plans are domestic only and include unlimited data, talk, text, 800 domestic voice roaming minutes and 100 MB domestic data roaming. International services extra and subject to applicable rates. Quality of Service Practices (QoS): Unlimited customers who use more than 23 GB of data during a billing cycle will be de-prioritized during times and places where the network is constrained. See virginmobileusa.com/legal#network-management for details. No Purchase Necessary to Enter or Win in the Virgin Mobile "Love Letters" Sweepstakes: Void where prohibited. Open to legal residents of the 50 U.S. and D.C., 18 or older. Sweepstakes begins at 12 a.m. EST on Jan. 26, 2018 and ends at 11:59 p.m. EST on Feb. 28, 2018, with two separate entry periods during that time. 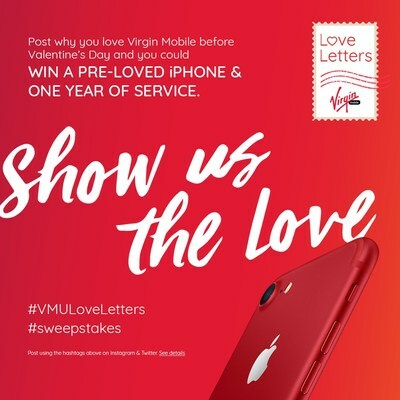 For complete official rules, including entry instructions and prize details, visit virg.in/LoveLetterSweeps Sponsor: Virgin Mobile USA, L.P.
Other Terms: Virgin Mobile has no annual service contracts; service is subject to terms and conditions. Offers/coverage not available everywhere or for all phones/networks. Prohibited network use rules and other restrictions apply. See virginmobileusa.com for details. ©2018 Virgin Mobile USA, L.P. All rights reserved. All other marks are the property of their respective owners.